The Tribeca Film Festival continued with many more new movies besides Grandma, and still many of these films, short films, and documentaries have big ideas they seek to share. 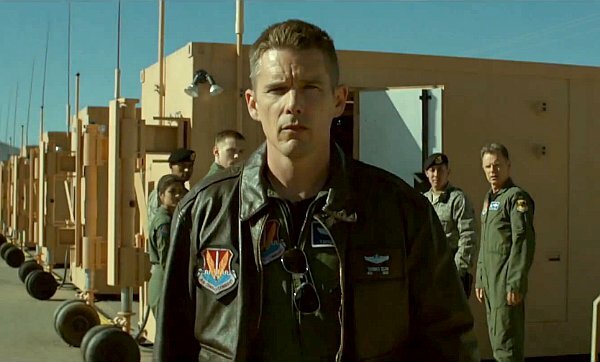 When I walked into the screening for Good Kill I was excited for some more big ideas, but I was even more excited for this reunion of Ethan Hawke and Andrew Niccol—director of Gattaca. So, I opted to skip over any other preliminary research about the film and just look forward to some good science fiction. Unfortunately, there is nothing science-fictional about Good Kill. Hawk plays Tom Egan, a former fighter pilot in the Iraq War. Now, Tom is a drone pilot based in Las Vegas. Like many soldiers who routinely terminate human beings (in this case, members of the Taliban), he is alienated from his family because of this psychological toll. Alcoholism plays no small part in wedging the gap between him and his wife, played by January Jones (Betty on Mad Men). 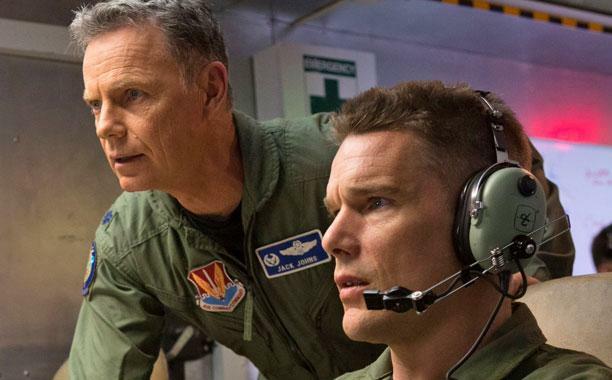 Good Kill brings many interesting concepts to light in a very direct fashion. By now everyone knows the United States military is using drones, and Tom’s superior, Lt. Colonel Johns (Bruce Greenwood) delivers to new soldiers a pat monologue that puts the whole issue into perspective. He compares drone piloting to an Xbox game and even states the program exists because of Xbox, which these soldiers have used in practice. In scenes following, we learn how closely the pilots can see their targets—the minute interactions, the emotional fluctuations, so on and so forth… This makes their job difficult, observing the humanity they are about to extinguish. But they do it. Hawke is a good actor and this is a heavy role, so here we have a good combination. This disillusioned, bitter pilot is not boring to watch, yet he isn’t particularly interesting other than the fact he is stationed securely in Vegas, as much distanced from the fighting as he is his family. Some of the scenes pay off, such as when he decides to show his vulnerability and disclose certain aspects of his job to his wife. The rest of the movie plays out like an endless series of moral dilemmas. It’s very serious business when Tom has to accomplish a “good kill,” always very serious even if all these scenes take place in a dark military office. But I get the feeling Niccol was trying to draw parallels, or otherwise comparisons for the sake of contrast, between these moral conundrums and the ones he faces in his personal life. Overall, it all seems like too much. It’s a little exhausting to watch, even if Hawke’s own exhaustion is acted perfectly. My other problem with this movie—unnecessary characters. So much fat here to lose and so much weak muscle here to toughen up. A coworker of Tom’s, who always seems very present in all drone-piloting scenes, has no lines but merely nods assholish assent to the other two-dimensional insensitive coworker; Tom has two children who do nothing, ever; the CIA, who calls all the shots and dictates the killing of innocents and terrorists alike, is just a wooden voice over the phone. Maybe there’s some thematic significance to that last one, but, if there is, the CIA voice is annoying anyway.